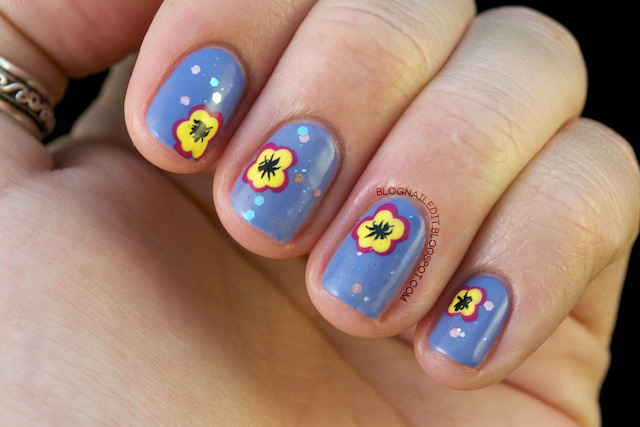 I was originally inspired for today's manicure by Gully Nails's post, Polka Dot Flowers. After looking at her design again, I know I kind of missed the mark, but I'm still sort of giddy about my own design. Sort of seems kind of Spongebob-esque. The base color here is Secret Peri-Wink-Le (China Glaze), overlaid with Whimsical (Revlon). The petals are a combination of Feeling Great (Sinful Colors) and Lightening (Sally Hansen Insta-Dri). Finally, I drew the inner pollen spots with Time Off (Sinful Colors). I will try this again to get it closer to Becky's design, because I absolutely love it. This is awesome, I wondered why my post had so many page views. I just made a dot a little further out and dragged it toward the centre for the outline so that it was more of an oval and then placed another dot over top of that. Glad you liked it! Yours looks amazing by the way. Gorgeous! Colours, glitter, design, everything!